I don’t understand why turkey doesn’t make it to the table more often. Chicken this. Chicken that. I love chicken but why not mix it up some? Turkey isn’t quite the blank canvas chicken is. You need to respect that. But if you do, there’s a whole new world of flavour to be discovered. Chipotle is one of those discoveries waiting to happen. It pairs fabulously. Turkey parts are the key to success. Roast turkey is tough to do because the bird cooks unevenly. Parts eliminate the problem. Cook a turkey breast. No harder than a chicken breast. Thighs? Same thing. Easy. I used boned out turkey thighs. Boning them out lets you slice them like you would a turkey breast. It’s a nice touch but it’s not critical. Turkey breast works equally well here. Just please leave on the skin. I don’t really need to tell you that, do I? 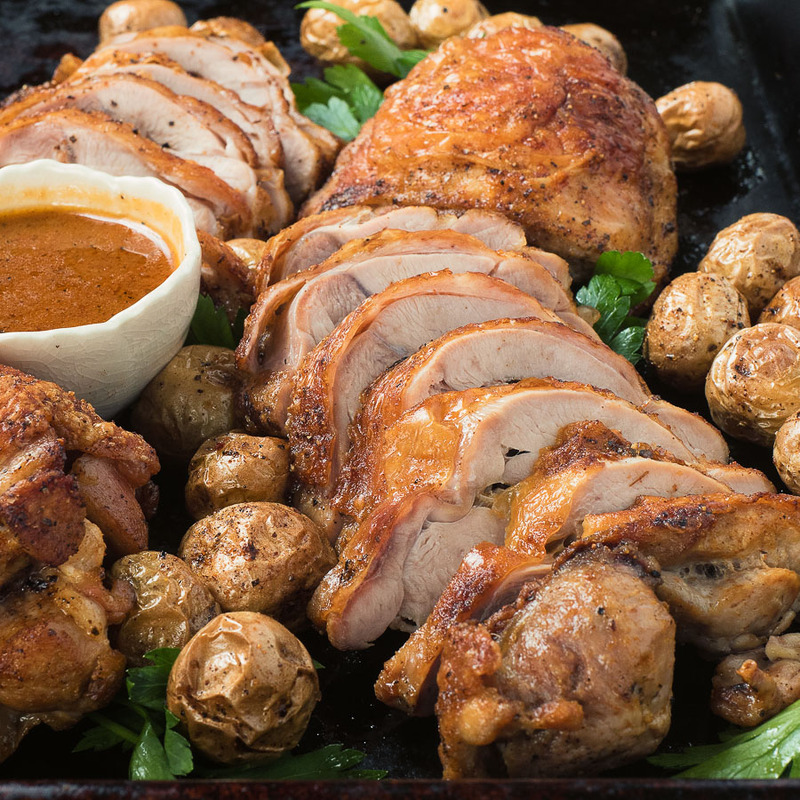 This is basically your holiday turkey made easy. You are still looking to get a good fond in the pan. You are making a simple gravy. The fond flavours the gravy. Sound familiar? 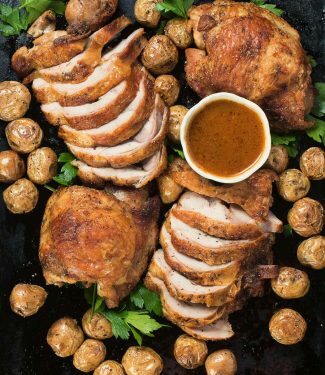 As easy as roasted chicken parts but with that great turkey flavour. What’s not to love? 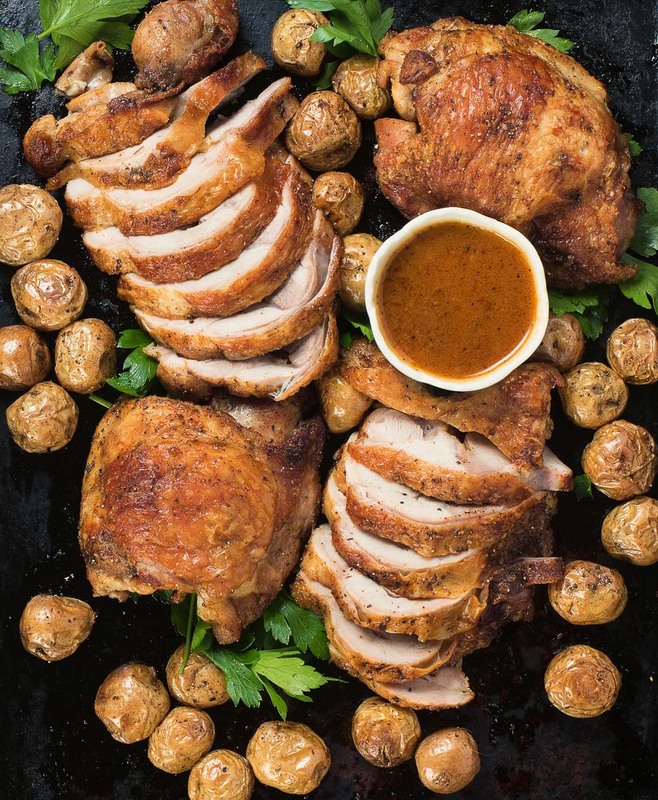 Roast turkey with chipotle gravy is an easy way to enjoy the great flavours of turkey without all the holiday hassle. Bone out the thighs. This isn't as hard as it sounds. Place the turkey thighs, skin side down, on a cutting board. Using a paring or small utility knife, run the blade along both sides of the bone. Cut around the knuckles at either end of the thigh bone, then slide your knife between the thigh and the bone to release the thigh. Pre-heat a skillet over medium heat. Film the skillet with olive oil. Rub the boned out thighs with olive oil and sprinkle liberally with creole seasoning. Working in batches of two, fry the turkey thighs, skin side down. You are going for lightly brown. Repeat with the two remaining thighs. Spoon off the fat in the pan. Roll the thighs into an approximation of what they looked like before you boned them. Place in the skillet, skin side up and roast until a thermometer reaches 175F, about 15-20 minutes. Remove the thighs from the skillet and spoon off all but about a Tbsp of fat. Add the flour and stir to scrape up any fond in the pan. Mix in the stock a bit at a time, stirring each time to incorporate. Add the chipotle and adjust salt to taste. To serve, slice the thighs 1/4 inch thick, fan on the plate and spoon the gravy overtop. You had me at chipotle gravy! I’ve never been a huge fan of turkey, probably because of the hassle to cook a whole one. Tackling smaller parts makes great sense, and the thighs would definitely be my first choice. Can’t wait to make this, thank you! Boned out turkey thighs work great. Fast, easy to cook evenly and a snap to carve. Roasting turkey parts is much easier than the whole bird. You don’t have to balance out the breast and the dark so it’s super juicy every time. Just make sure to use your instant read thermometer and you can’t go wrong.